Central Florida boasts the most exciting and elaborate them parks in the World. In a 30 mile radius, Central Florida visitors can ride a rocket shooting toward space, or slip down an endless water slide into a cool ocean of water. 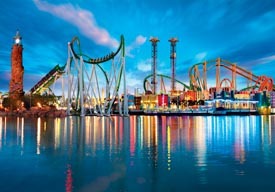 See what Major Theme Parks Central Florida has to offer! Are you tired of the same old water parks and community pools? 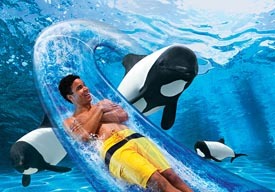 The Orlando area is the home to over 6 thrilling water parks that will surely bring the fish out in you. Aquatica, SeaWorlds Water Park® visitors can swim with the dolphins, watch acrobatic shows with massive whales, or relax on the lazy river. Orlando is the home of the most entertaining family-friendly and grown up nightlife in the nation. Test your karaoke skills at Rising Star in Universal CityWalk®, jam out with the dueling pianos at Pat OBrians, and round off your evening at the Midieval Times dinner show. When you visit Orlando attractions, remember to pack extra energy! Orlando is always changing and so our site is too. New attractions, new parks, new shows are always being created. Our site does it's best to inform you of all new and exciting adventures available for your family to experience. 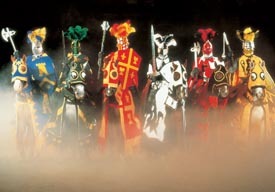 If you have heard of a new show and don't see it list, please let us know and then check back for updated information.